Delivery company UPS have demonstrated a new delivery drone concept they have been working on which allows a UPS truck to deploy an autonomous drone from its roof, enabling it to deliver a parcel while the driver delivers another. 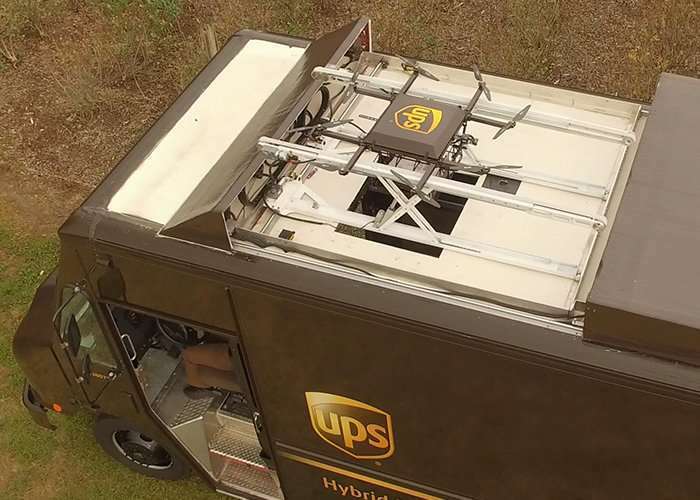 Watch the video below to learn more about the autonomous rooftop delivery drone which is launched from a sliding roof compartment and loaded with a package by the driver from below. The system has been designed to increase the drivers efficiency on sprawling rural routes, allowing for two parcels to be delivered in the time of previously delivering one. As you can imagine this is currently just a concept which has been unveiled by UPS, but hopefully it won’t be long before drones take to the skies to deliver parcels even faster. As soon as more information is made available from UPS about further concepts to improve delivery times or more details about the rollout of a drone-based autonomous system we will keep you up-to-date as always.